Join us at REI on Wednesday, November 8 for a free “Tales on Trails” presentation and talk about the cool, local trails found in your backyard. Ojai Valley Land Conservancy Director of Advancement, Tania Parker, and Wild About Ojai Partner, Craig Carey will share their exceptional expertise, tails on each trail, and the information on the latest wildlife night research projects currently underway. Come find out what happens in the outdoor places you love to enjoy. Free event. Ojai Valley Land Conservancy is a REI Grant Partner. 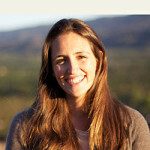 Tania grew up in the Ojai Valley and after graduating from Thacher School, she obtained her degree in Forestry and Natural Resources Management Cal Poly, San Luis Obispo. She then later went on to earn a certificate in graphic design from UCSB. In her role with the OVLC, she connects local and regional supporters with land conservation efforts in Ojai. She came to nature in childhood through the Ojai Valley’s abundant open lands where hidden swimming holes and rocky caves were treated like secret mining claims; each special and worthy of protection. Tania’s path to land conservation was along the scenic route. Starting with her degree in Forestry and Natural Resources Management she passed through jobs in sales, backcountry horseback guiding, personal training, and graphic design. Tania combines her experiences among local people and land with an eye of a graphic artist to interpret both the physical and cultural landscapes of the Ojai Valley in ways that create strong bonds with donors and the community. In her free time, Tania and her husband Tobias can often be found hiking or climbing on the OVLC trails and preserves with their dog Topa, or exploring other favorite outdoor destinations throughout the western states. Craig grew up wandering the Los Padres backcountry with his folks, his older brothers, and his fellow Scouts. On any given weekend, Craig was swimming the narrows along the Sespe, wandering the granite-clad tops of Mt. Pinos, or learning to navigate the trackless pinon forests of the Cuyama badlands. It was — and remains — a huge backyard full of opportunity. 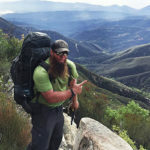 Craig has been leading Girl Scouts, Cub Scouts, and Boy Scouts across the Los Padres for years and leads and/or serves on several US Forest Service volunteer crews across the forest — ranging from microtrash clean-ups in condor country to invasive species removal in the watersheds to trail maintenance in remote wilderness corners. This is the land he loves … and loves to share with others. He literally wrote the book on the southern Los Padres. See here for details about Hiking & Backpacking Santa Barbara & Ventura, published by Wilderness Press).